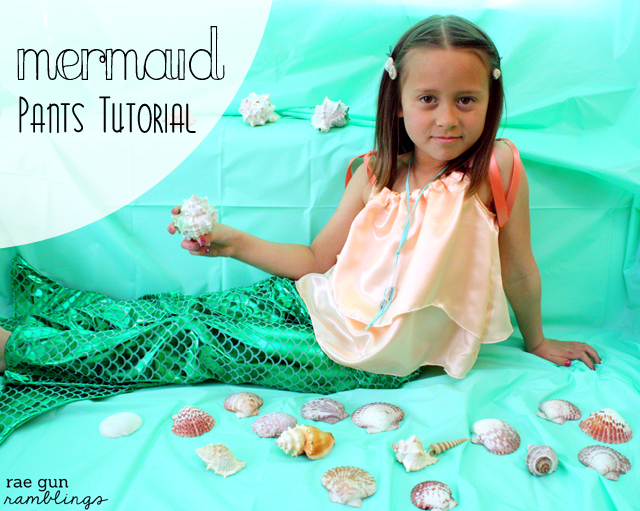 Last week I share my Mermaid Flutter Top Tutorial and this week I’m sharing the rest of the outfit, my favorite part, the Mermaid Pants tutorial! Flash back to last Halloween whilst in the midst of Pebbles and Bam Bam craziness I ran to my local Jo-Ann to restock on a few things. But then I saw this awesome green shinny fish scale fabric and I knew I had to have it. In true Marissa fashion I bought the rest of the bolt. 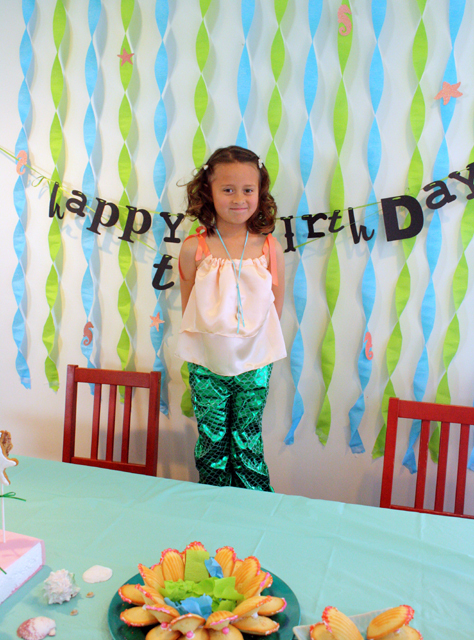 Luckily when T announced she wanted a Mermaid Birthday Party I knew just what to make her. And the lesson is fabric hoarding is a good thing. The pants are relatively easy. If you’ve made PJ pants before you should be able to do this. It’s just a few extra steps. I’m going to show you have to make this by taking the pattern off of a pair of pants you already have but feel free to use a trusty pant pattern instead. If you do that you’ll want to skip down to step 5. Turn your pants that you are using as the pattern wrong side out. Line up all the seams and fold in like pictured so that the center is on the outside. Lay on top of your fabric that is folded in half. With a fabric marker trace along the top around the curve, down the leg and along the bottom edge (make sure to give yourself a generous seam allowance). Flip over and repeat . Now you should have two pant pieces. With right sides together sew along the curve. Open the fabric up and bring together the bottom of the curves on both pieces. This is the crotch. Pin here and sew along the inseam of the pants (the long edges extending from this point). You should now have something resembling pants. 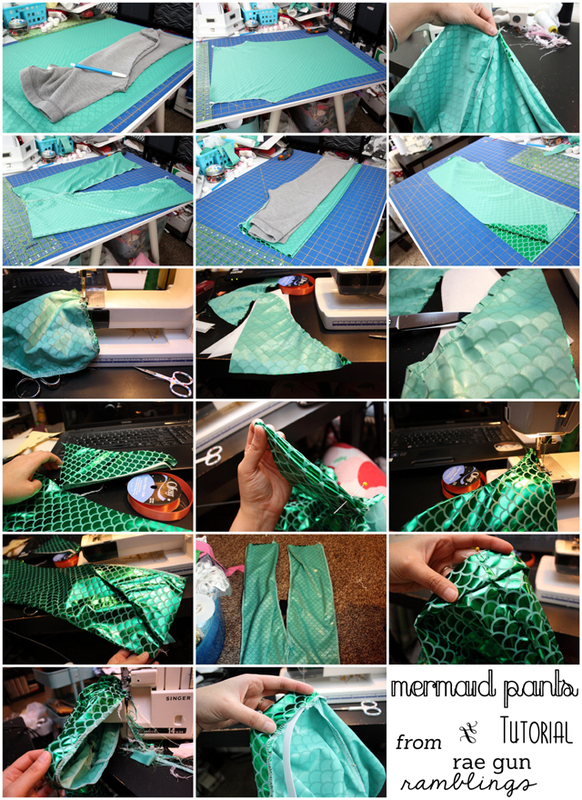 Fold in half and slice down the side (you’re opening up the side of the leg to put the fin in). If your pants are big compared to your pattern trim off any excess. Now you should have pants with slits down the sides. This next step is not pictured. Cut a strip 5 inches by however long you need the waist band. You can get that number by measuring across the top of your pant piece and multiplying by 2. Hem the bottom edge (yes you still want the slit to be open). I did this by serging the edge and folding under and sewing. Next draw yourself a fin. I just free handed it and held it next to the pants and adjusted until I thought it looked right. With your fabric folded cut out 2 times (so you have 4 pieces, 2 in each direction) and then cut two pieces out of the interfacing. Take two fin pieces right sides together and sew around the curve. Repeat for the other fin and snip to the sewing line to help it lay flat when you flip it. Turn right sides out and insert interfacing. Trim off any that hangs over the edge. Tuck the fabric in along the bottom (if you need to you can trim off some more of the interfacing. Sew along the bottom edge. Place fin with the straight edge alined to the bottom edge of the pant. Sandwich in between the front and back part of the pant leg and sew down the side. Repeat on the other leg. Sew the shorts sides of the band right sides together so it forms a tube. Now fold the fabric so the rights sides are showing. Take the band and pin it right sides together to the top of the pants. You want the raw edges positioned up and the fold pointing down. Sew around leaving a gap to insert elastic. 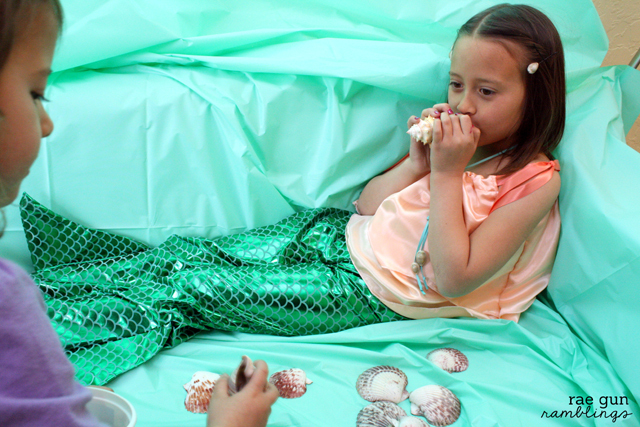 Admire your adorable mermaid pants! This is what they look like standing up. I wish I had gotten more pictures of it like this because I just love how they hang on her and how the little fins stick out. PS if you haven’t seen the oyster cookie tutorial that my mom did check it out its so cute! And I had to include this last behind the scenes picture of little sister L being the prop master. If you saw the Mermaid Top tute you know she kinda forced her way into the outfit herself haha. I hope you like! Those pants are sooooo cute! I am going to have to keep an eye out for some of that fabric. My daughters would love this outfit. Pinned!! I saw that link it said I posted and that’s not my blog. Crazy how I accidentally switched two letters and it was a different blog. PINNED IT! My little girl LOVES Aie-yol (Ariel) and she would die happy to wear these pants! Thanks for sharing! Fabric hoarding is ALWAYS a good thing. ALWAYS! I am glad you were willing to type this up twice. So cute! Oh these are adorable! Just love them!! This tutorial is awesome, except that I don’t know a thing about sewing. no bueno. If you find more of this fabric I NEED you to make me a pair (for my daughter to wear, not me ;) ). Love this!! That fabric makes this project sing. I am so keeping this one top of mind for Halloween! Love this! It would be a perfect post to link up at my pin it proudly link party – Go check it out! I LOVE this!!! So adorable! And thanks for the great tutorial and thanks for sharing at For the Kids Fridays. I am featuring you at this week’s party! Hope to have you share again soon at Sun Scholars. Love these pants! They are perfect for our upcoming Disney trip. I want my daughter (and nieces!) to have comfortable princess wear and they are all Ariel obsessed. Did you line these pants? The foil in the fabric makes them seem a little static-y so I thought about lining with a very lightweight knit for comfort. Did yours wash up well over time? I see these being a must wear item in my daughter’s closet! Thanks so much. I used your tutorial to make Kimg Triton pants for my 3 year old son. They came out perfect. Thank you! oh yay I love hearing that! I found you on Pinterest after searching for a King Triton costume, and searching and searching for something reasonably wearable for my 3 year old son who wants to be King Triton. 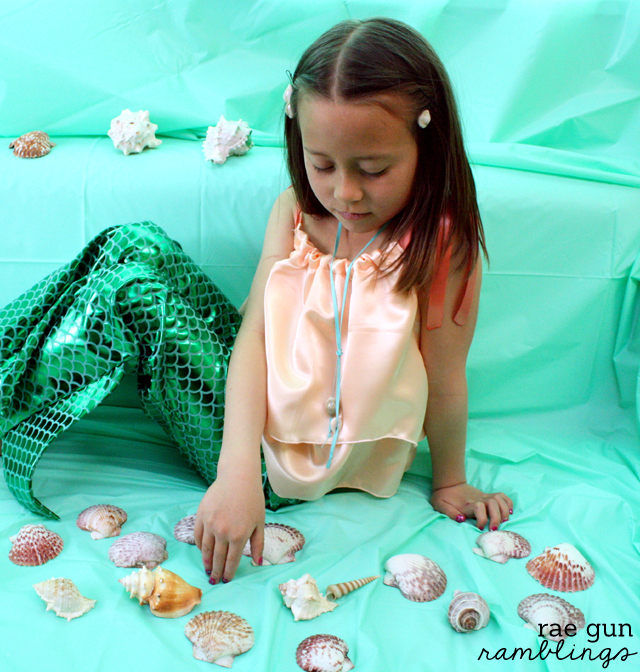 I finally did a search for “mermaid pants” and found this post and it is PERFECT. I made them in one night, which included a trip to the fabric store. I got some rich blue taffeta which I have never sewn with before and they turned out great! Thank you so much. He is one happy l little guy!